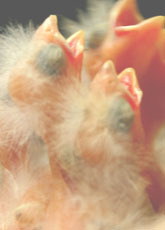 Finches are bred and raised all the time by hobbyist and aviculturist all over the world. It would be ideal if they were all always born healthy and intact but that doesn't always happen. 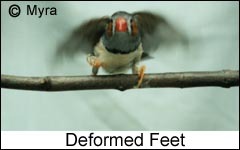 For some, these special needs finches are a huge burden and many are culled after their disability is discovered. Others tho, are saved and either cared for by the breeder or passed on to someone willing to take in the less than perfect finch. My first disabled finch was one born in my home. He was always in good health but had very short stubby toes which made perching more difficult. The modifications to his cage were fairly easy, removing all round perches and putting in small squared ones. He lived for over 10 years. He even outlived his female. But because his problem was genetic I never allowed him to breed. I didn't have another encounter with a disabled finch until 5 year ago. A lady with a one-legged Society finch didn't have the time to care for him anymore so she brought him to me. He was a pathetic looking bird, feathers matted, bald spots, swollen eye, couldn't fly, and the one foot missing just below the ankle joint. He couldn't even stand up on his own. He'd been crawling around on his belly for a years. Once I had gotten him home he was quickly named Mr. Stump and a small cage was modified for him. The floor was raised using cardboard so it was flush with the edges of the food and water cups. All he had to do was crawl over and put his head down to eat and drink. He was cleaned, the eye was treated and he actually started looking like a bird again. He eventually got used to being handled by humans and stopped trying to get away. It took years and with the help of anther male society finch we did get Mr. Stump to perch and to fly a little. Stump and his friend lived for 6 years together before Stump died of old age and his friend moved back into the aviary. Shortly after I got Mr. Stump, word got out that I was willing to take in these unwanted finches and they started showing up on my door step. 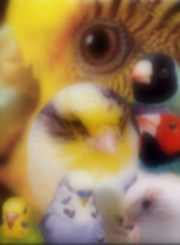 I had calls, e-mails and letters from people looking to get rid of their disabled finches. Of course I couldn't say no, so I took them in. Some of them came from as far away as California, others from just across town. Most were zebras and society; with twisted legs, missing feet, and/or bald. Each bird was named, treated for any infection, illness or sores on its body and put in a modified flight cage. After so many came in I had to build up a larger cage to hold them all comfortably while making sure they could each reach the food and water. Everyone was so appreciative that I would take these finches in and care for them. All around the world you can find organizations and shelters willing to take in parrots and other large birds but until recently there hasn't been anyone or any place to take disabled finches. There hasn't been any information available on how to care for them properly. 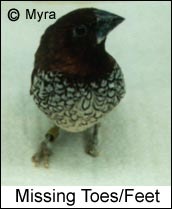 One of the problems with caring for a disabled finch instead of a parrot is that a finch can not crawl around using its beak and toes and parrots can. If they can't fly or balance in a location with easy access to food and water they will die. When modifying a finches cage that must be kept in mind. For birds that can not perch, food and water needs to be made available from the floor no higher than the finch can lift its own head. If the finch can't fly, all perches, dishes, and any toys need to be within hopping distance with no obstacles in the way. When taking in a disabled finch it is fine to give the finch a companion but with all new finches watch for signs of aggression and it's best not to allow them to breed. You don't always know if the disability was an injury or a genetic flaw. Genetic flaws will be passed on to the young even if they don't appear in that generation, they will surface again in time. Some of the more common genetic handicaps are blindness, overgrown or twisted bill, missing parts (frequently toes and feet, sometimes eyes), twisted legs. Over grown bills require regular trimming to allow the finch to eat. Blindness will require a small cage so food and water can be located easily. 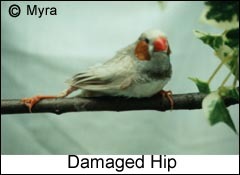 Common injuries include broken leg, hip, or wing. Severed legs, damaged eyes (usually result from fights), and Arthritis. If the injury occurred a long time ago the finch has probably adapted quite well to the new limitations, if the injury is recent you may need to help with rehabilitation. Start by letting the injury heal in a hospital cage, then slowly move into a larger cage to encourage the finch to move more. Another source of unwanted finches is the very old finches. They don't breed well, and seem to linger on near death. They aren't as active, pretty, and tend to sleep a lot. The number of elderly finches is quite small, most simply drop dead one day, but with the better standards of care they are receiving they are living longer and longer. Mangled or missing feathers aren't usually a handicap on their own. Feathers do regrow. Finches which support themselves on a feathered area of the body tend to damage their feathers quickly, giving them a very scruffy look and even bald areas. Fortunately, I am not alone in my willingness to care for these finches. There are others willing and ready to take in these disabled finches all across the county. A small network of people have gotten together to help find homes for some of these finches. These are just people doing what they can to make the finches lives a little more comfortable.